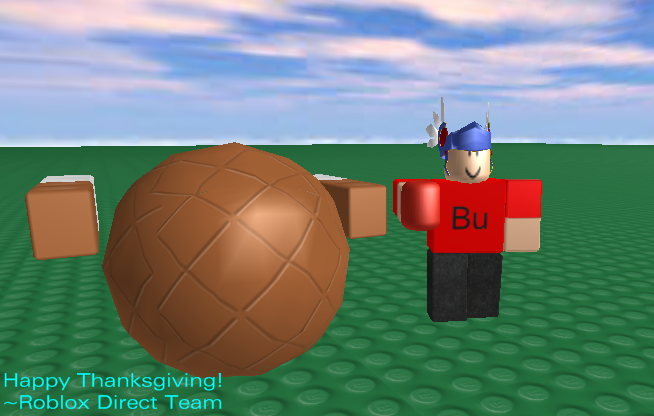 Thanksgiving 2008 | Roblox Direct!! Its almost time to hunt for some turkeys…. cas its geting close to Thanksgiving! A time to together with your family and enjoy a big yummy meal. Today two hats went on sale. Say hello to Mr.Gold Buckle Capotain. Hes the new hat for Thanksgiving. You thought roblox wouldnt atleast upload a hat for thanksgiving? you were wrong! This cool hat is like the Pilgrim Hat only with a gold buckle. Cool huh? This hat is on sale for 165 robux. This is the Pilgrim Hat. It went on sale last thanksgiving in 2007. It went back on sale for about 150 robux. Nothing much to say about it… but its pretty cool. Well what else will roblox do for thanksgiving? We will have to find out later on.